Pancreatitis, although uncommon during childhood, is associated with significant morbidity and mortality. Pancreatitis is characterized by inflammation of the pancreas, clinical signs of epigastric abdominal pain, and elevated serum digestive enzymes. Pancreatitis can be local or diffuse and is classified as acute, chronic, inherited, necrotic, or hemorrhagic. Occasionally, pancreatitis is complicated by the formation of a fibrous-walled cavity filled with pancreatic enzymes, termed a pseudocyst. See the images below. This CT scan of the abdomen in the region of the pancreas demonstrates a large well-marginated cystic structure that represents a pancreatic pseudocyst. 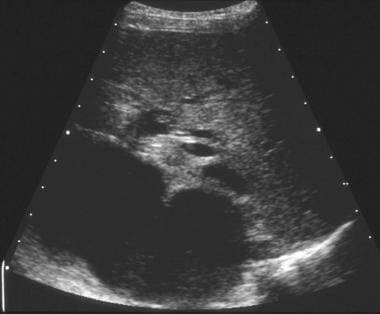 This real-time ultrasonography of the abdomen, with attention to the right upper quadrant, revealed a loculated fluid collection in the hilum of the liver. This was compatible with a pancreatic pseudocyst. Differential diagnosis included a large choledochal cyst. For excellent patient education resources, visit eMedicineHealth's Digestive Disorders Center. Also, see eMedicineHealth's patient education articles Pancreatitis and Abdominal Pain in Children. In general, the prognosis of children with acute pancreatitis is excellent, although pseudocysts have been reported to complicate 10-23% of acute episodes. In addition, when associated with abdominal trauma, the frequency rate of pseudocyst identification is higher than 50%. Approximately 60% of pancreatic pseudocysts that are caused by blunt trauma require surgical intervention. Pancreatitis is uncommon in the pediatric population. Importantly, clinicians evaluating patients with symptoms of abdominal pain should have a high index of suspicion for pancreatitis. Pancreatitis originates with blockage or disruption of the collecting ducts and damage to the pancreatic acinar cells, which leads to activation and release of digestive enzymes. The activated enzymes autodigest the pancreatic parenchyma, causing inflammation and, potentially, necrosis. Localized collections of pancreatic secretions may become walled off by granulation tissue and form a pseudocyst either within the pancreatic tissue or immediately adjacent to it. As a result of limited case reporting and underdiagnosis by physicians, the frequency and true incidence of pancreatitis in children is unknown. 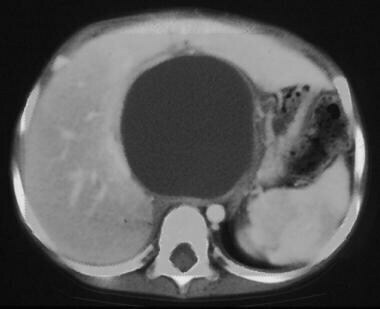 Pseudocysts complicate acute pancreatitis in approximately 10-23% of cases. The incidence of pancreatic pseudocysts is greater than 50% when associated with traumatic injury to the abdomen. Common causes of pancreatitis are extensive but include blunt abdominal trauma (eg, motor vehicle collision, abuse, bicycle accident where the abdomen is compressed by the handlebars), systemic infection (eg, mumps, rubella, coxsackie virus B, cytomegalovirus [CMV], human immunodeficiency virus [HIV]), pancreaticobiliary malunion, congenital anomalies of the pancreato-biliary junction, pancreas divisum, congenital sphincter of Oddi abnormality, choledochal cysts, or choledocholithiasis. Use of hyperalimentation, medications (eg, azathioprine, tetracycline, L-asparagine, valproic acid, steroids and immunosuppressive agents), and metabolic abnormalities (eg, hypertriglyceridemia, hypercalcemia, cystic fibrosis) may incite pancreatitis. Hereditary pancreatitis in children, the second most common congenital pancreatic disorder following cystic fibrosis, is characterized by an alteration in the long arm of chromosome 7, which yields an aberrant trypsinogen protein that may induce autodigestion of the pancreas. The specific inciting factors causing pancreatitis remain to be elucidated. Pancreatitis may be induced by primary acinar cell injury as a result of viral infections, drugs, ischemia, and direct trauma. Pancreatitis may originate from a disruption of the ductal system and subsequent excretion of digestive enzymes from the acinar cells of the pancreas. Normally these cells release inactive enzymes into collecting ducts, which then drain into the main or accessory pancreatic ducts emptying directly into the duodenal lumen. If obstruction or disruption of these ducts occurs, the pancreatic secretions are activated within the parenchyma of the pancreas and initiate autodigestion of the pancreatic tissue. Interstitial edema is an early finding. Exacerbation of pancreatitis may result in pancreatic necrosis, blood vessel occlusion or disruption inciting hemorrhage, and systemic inflammatory response syndrome with multiorgan failure. Collections of pancreatic secretions often become walled off by granulation tissue to form a pseudocyst either within or adjacent to the pancreas. Predominantly, the pseudocyst is localized in the lesser sac behind the stomach. The stomach, duodenum, colon, small bowel, or omentum may abut or form part of the pseudocyst capsule. Classically, pancreatitis in adults presents with midepigastric pain radiating to the back. In children, the presenting signs and symptoms can be quite varied. Most commonly, a child with acute pancreatitis presents with abdominal pain (87%) with vomiting (64%) and abdominal tenderness (77%) with abdominal distension (18%). Other, less common clinical signs include fever, tachycardia, hypotension, jaundice, abdominal guarding, rebound tenderness, and decreased bowel sounds. Eating may exacerbate the abdominal pain. Acutely ill children may lie on their side with the hips and knees flexed. The pain typically increases in intensity for 24-48 hours. The clinical course for acute pancreatitis is variable. Often, children may require hospitalization for analgesia, bowel rest, and rehydration with fluid and electrolyte therapy. Acute hemorrhagic pancreatitis rarely occurs in children. This is a life-threatening condition with a mortality rate approaching 50% because of shock, systemic inflammatory response syndrome with multiple organ dysfunction, acute respiratory distress syndrome (ARDS), disseminated intravascular coagulation, massive GI bleeding, and systemic or peritoneal infection. Physical examination findings associated with hemorrhagic pancreatitis may include a bluish discoloration of the flanks (ie, Grey Turner sign) or periumbilical region (ie, Cullen sign) because of blood accumulation in the fascial planes of the abdomen. Additional signs include pleural effusions, hematemesis, melena, and coma. Chronic pancreatitis in children is associated with trauma, systemic disease, and pancreaticobiliary malformations, most commonly pancreatic divisum. In the United States, the most common cause of chronic relapsing pancreatitis in children is hereditary pancreatitis. Patients with this disease typically present with chronic abdominal pain that can be difficult to treat. These patients have recurrent episodes of upper abdominal pain associated with varying degrees of pancreatic dysfunction and have increased risk of developing pancreatic insufficiency, adenocarcinoma, and pancreatic pseudocysts. Children with pancreatic pseudocysts may present with localized abdominal pain and a palpable tender epigastric mass or abdominal fullness. Additional symptoms include jaundice, chest pain, nausea, vomiting, anorexia, weight loss, fever, ascites, and rarely, GI hemorrhage. Treatment of pediatric patients with chronic pancreatitis requires the collaborative efforts of multispecialty teams that include gastroenterologists, surgeons, pharmacologists, nutritionists, child life specialists, psychologists, and psychiatrists. The pancreas is divided up into a head, body, and tail, although no distinct anatomic borders indicate these divisions. Most of the pancreas is extraperitoneal, with just a portion of the tail coming through the mesenteric folds. The head is to the right of L2, the body overlies L1, and the tail rises up to the left of T12. The abdominal aorta and vena cava function to cushion the pancreas from injury against the vertebral bodies. However, with crushing or blunt abdominal trauma, the pancreas can be injured by compression against the vertebra. Numerous congenital abnormalities of the pancreatic biliary system have been described. Pancreatic divisum, which occurs in 5-15% of the population, results from unsuccessful fusion of the embryonic ventral and dorsal pancreatic buds. As a result, the accessory duct of Santorini derived from the dorsal bud drains the majority of the pancreas. Because the accessory duct is smaller in caliber than the duct of Wirsung, inadequate pancreatic drainage may result in chronic pain and recurrent pancreatitis. Sphincteroplasty is contraindicated in patients with evidence of intrapancreatic ductal obstruction. Pancreatic pseudocysts with associated major ductal disruption or a transected pancreas require operative therapy with cyst enterostomy. Definitive management with subtotal or total pancreatectomy is associated with considerable morbidity and mortality due to loss of both endocrine and exocrine functions of the pancreas. Generally, surgery is not indicated in children; however, it may be considered in cases of intractable pain and diffuse parenchymal damage without ductal dilation. Benifla M, Weizman Z. Acute Pancreatitis in Childhood: Analysis of Literature Data. J Clin Gastroenterol. 2003. 37(2):169-172. [Medline]. Russell KW, Barnhart DC, Madden J, Leeflang E, Jackson WD, Feola GP, et al. Non-operative treatment versus percutaneous drainage of pancreatic pseudocysts in children. Pediatr Surg Int. 2013 Mar. 29(3):305-10. [Medline]. Abu-El-Haija M, Palermo JJ, Fei L, Lin TK. Variability in Pancreatitis Care in Pediatrics: A Single Institution's Survey Report. Pancreas. 2015 Oct 22. [Medline]. Abu-El-Haija M, Wilhelm R, Heinzman C, Siqueira BN, Zou Y, Fei L, et al. Early Enteral Nutrition in Children with Acute Pancreatitis. J Pediatr Gastroenterol Nutr. 2015 Oct 19. [Medline]. Burnweit C, Wesson D, Stringer D, Filler R. Percutaneous drainage of traumatic pancreatic pseudocysts in children. J Trauma. 1990 Oct. 30(10):1273-7. [Medline]. Graham KS, Ingram JD, Steinberg SE, Narkewicz MR. ERCP in the management of pediatric pancreatitis. Gastrointest Endosc. 1998 Jun. 47(6):492-5. [Medline]. Hsu RK, Draganov P, Leung JW, et al. Therapeutic ERCP in the management of pancreatitis in children. Gastrointest Endosc. 2000 Apr. 51(4 Pt 1):396-400. [Medline]. [Guideline] Adler DG, Baron TH, Davila RE, et al. ASGE guideline: the role of ERCP in diseases of the biliary tract and the pancreas. Gastrointest Endosc. 2005 Jul. 62(1):1-8. [Medline]. Fisher JM, Gardner TB. Endoscopic therapy of necrotizing pancreatitis and pseudocysts. Gastrointest Endosc Clin N Am. 2013 Oct. 23(4):787-802. [Medline]. Bellin MD, Carlson AM, Kobayashi T, et al. Outcome after pancreatectomy and islet autotransplantation in a pediatric population. J Pediatr Gastroenterol Nutr. 2008 Jul. 47(1):37-44. [Medline]. Azhari H, Rahhal R, Uc A. Is Total Pancreatectomy with Islet Autotransplantation A Reasonable Choice for Pediatric Pancreatitis?. JOP. 2015. 16 (4):335-41. [Medline]. Adamson WT, Hebra A, Thomas PB, et al. Serum amylase and lipase alone are not cost-effective screening methods for pediatric pancreatic trauma. J Pediatr Surg. 2003 Mar. 38(3):354-7; discussion 354-7. [Medline]. Ford EG, Hardin WD, Mahour GH, Woolley MM. Pseudocysts of the pancreas in children. Am Surg. 1990 Jun. 56(6):384-7. [Medline]. Behrman RE. Pancreatitis. Nelson Textbook of Pediatrics. Philadelphia, PA: WB Saunders Co; 2000. Gates LK. Preventive strategies and therapeutic options for hereditary pancreatitis. Med Clin North Am. 2000 May. 84(3):589-95. [Medline]. Kimble RM, Cohen R, Williams S. Successful endoscopic drainage of a posttraumatic pancreatic pseudocyst in a child. J Pediatr Surg. 1999 Oct. 34(10):1518-20. [Medline]. Kisra M, Ettayebi F, Benhammou M. Pseudocysts of the pancreas in children in Morocco. J Pediatr Surg. 1999 Sep. 34(9):1327-9. [Medline]. Lerner A, Branski D, Lebenthal E. Pancreatic diseases in children. Pediatr Clin North Am. 1996 Feb. 43(1):125-56. [Medline]. Neblett WW 3rd, O'Neill JA Jr. Surgical management of recurrent pancreatitis in children with pancreas divisum. Ann Surg. 2000 Jun. 231(6):899-908. [Medline]. Nijs E, Callahan MJ, Taylor GA. Disorders of the pediatric pancreas: imaging features. Pediatr Radiol. 2005. 35:358-73. [Medline]. Pietzak MM, Thomas DW. Pancreatitis in childhood. Pediatr Rev. 2000 Dec. 21(12):406-12. [Medline]. Pitchumoni CS, Agarwal N. Pancreatic pseudocysts. When and how should drainage be performed?. Gastroenterol Clin North Am. 1999 Sep. 28(3):615-39. [Medline]. Sinclair DB. Valproic acid-induced pancreatitis in childhood epilepsy: case series and review. Journal of Child Neurology. 2004. 19:498-502. [Medline]. Stringer MD. Multidisciplinary management of surgical disorders of the pancreas in childhood. Journal of Pediatric Gastroenterology and Nutrition. 2005. 40:363-7. [Medline]. Weber TR, Keller MS. Operative management of chronic pancreatitis in children. Arch Surg. 2001 May. 136(5):550-4. [Medline]. Weckman L, Kylanpaa ML, Puolakkainen P, Halttunen J. Endoscopic treatment of pancreatic pseudocysts. Surg Endosc. 2006 Apr. 20(4):603-7. Werlin SL. Pancreatitis in children. Journal of Pediatric Gastroenterology and Nutrition. 2003. 37:591-5. [Medline].